We often tell folks that they can pre-order almost any book at any indie bookstore; despite how publishers and authors inexplicitly tell people to go to Amazon (which may, admittedly, be easy, since they get data from publishers usually before anyone else) it is nonetheless true that indie stores are happy to serve their customers with personalized attention. We are encouraged when somebody thinks to send a pre-order our way and appreciate the business. Before telling you of a few eagerly awaited forthcoming books which you might want to pre-order now, take a look at this lovely article written about indie bookstores and small publishers. You’ll be tickled to see Hearts & Minds described so well by Valerie Weaver-Zercher, an editor at Herald Press. “Books Love the Small: How Indie Stores and Publishers Fill the Niches” first appeared in the Pittsburgh Post Gazette in honor of Indie Bookstore Day last weekend. Nice, huh? 20% OFF THE REGULAR RETAIL PRICE. All you have to do is go to our secure order form page, enter your information, and tell us what you want. We’ll reply back with a personal email and confirm everything. Easy. This book is without a doubt one of the most important books for 2018. Agree fully or not with his assessment of how many evangelicals got so deeply in bed with the bizarre and brazen Donald Trump, it is an expert study of the recent history of the role of conservative religion and right wing politics. Which is to say it is an important book for anyone who cares about our republic, or about the integrity of the Christian witness in the world. Fea is a good friend, an esteemed and pleasantly intense history professor at nearby Messiah College. His book Was America Founded as a Christian Nation? has won a number of awards and has appeared on our own “Best of…” list the year it came out. We stock an earlier work, too, about a colonial leader and his embrace of almost a Wendell-Berryesque agrarianism in the 18th century, The Road of Improvement Leads Home. That is also the name of his very popular and widely read blog where he has been offering his own historian’s take on and analysis of the role of conservative evangelicals in the 2016 Presidential primary and national election. (By the way, I just read Katy Tur’s Unbelievable: My Front-Row Seat to the Craziest Campaign in American History, her very spicy memoir of her front line reporting on the hot mess of that primary and the subsequent national campaign, embedded as she was with the team Trump. Wow; just wow. If you are interested in politics at all, it’s worth ordering from us. I couldn’t put it down.) Although there are many secular books coming out on the spectacle of Trump’s first years (although very partisan, I highly recommend a new one we carry called Bad Stories: What the Hell Just Happened to Our County by the always interesting Steve Almond) no one has studied well the history of the rise of the evangelical movements role in the Donald Trump campaign and administration with as much insight and authority as John Fea. Which leads me to the second large credential that sets this author apart from others reporting on this topic. John is, in fact, an evangelical. He teaches at a Christian college in the evangelical tradition. He regular attends an evangelical church that might be described as mega. He regularly is involved in uniquely evangelical meetings and conferences with the likes of evangelical scholars like Jay Green of Covenant College and Mark Noll of Wheaton College and Eric Miller of Geneva College. That he has a dog in this fight, as they say, is clear, although he writes with considerable fairness and explains the cultures of fear and alarmism and culture warring with evangelicalism with more charity than might be expected. He dons the role of the prophet at times and is hard-hitting in his critique, but one senses this is the cry of a wounded friend, a “lovers quarrel” as Frederick Buechner once put it. Extremist fundamentalists and Pentecostals are the very groups that modern-day evangelicalism broke away from. Evangelicals are post-fundamentalists; their main journalistic organ, Christianity Today (co-founded by Billy Graham himself) wrote firm rebukes of Trump during the campaign and discouraged their readers from any enthusiastic support. If there is any weakness to Believe Me it is that (for understandable reasons) it doesn’t fight this fight of reclaiming or clarifying the word evangelical and fails in calling those who surround the President evangelical, when I submit that they are mostly not. Many of them, in fact, despise evangelicalism for being too moderate, too intellectual, too ecumenical. Yet, Doc Fea’s historian’s eye is helpful on all this, and he reminds us that this rise of quasi-evangelical fundamentalism and the weirder versions of Pentecostalism has developed in the context of broad evangelicalism arising from its storied past. He talks about many of the episodes and factions of evangelical history such as the rise of the holiness movement, the Southern racial tensions in the Antebellum years, of dispensationalism, the impact of the Scopes trial, and other such seminal events and trends. As the reader can see, this short history of evangelical fear is actually pretty long – going back to the very establishment of European settlement in America. The various fears that combined to drive [some] white evangelicals into the arms of Donald Trump have deep roots in American history. Fea’s study of the politics of fear, the desire for power, and the role of nostalgia, is nearly brilliant. He knows his American history, he knows the recent players and issues that have lead many evangelicals on a road to Trump, incongruous, as it has been. He invites us in a wonderful concluding chapter to Biblical hope to counter fear, Christ-like humility instead of power, and the study of history as the antidote to idolatrous nostalgia. Believe Me is a very important book and I hope you pre-order it today. I am sure we will be among the first to have it by mid-June. 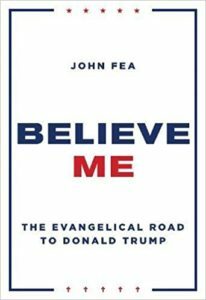 And, if you are near central PA, keep an eye open as we hope to host John here at the shop talking about Believe Me. TBA, as they say. This is a book for which many of us have been waiting for years! Alan Noble is a fascinating young scholar, witty and active, never quite predictable, with a great social media presence. You should know his stuff. 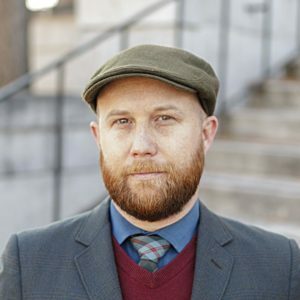 Although he teaches English at Oklahoma Baptist University he write about public affairs, too, and is also the cofounder and editor and chief of Christ and Pop Culture an online journal which is well worth reading. He has written for outlets as diverse as the Atlantic, Vox and Buzzfeed and First Things, Christianity Today and the Gospel Coalition. Which is to say, he’s my kind of guy. Obviously, we live in a distracted and distracting age. Newbigin, for instance, importantly shows how pluralism leads to pluralizing; choice and change are constant and that only complicates our efforts, such as they are, to pursue substantive reflection and deep engagement with the world. Is Taylor right that we live in an age when all beliefs are “equally viable and real transcendence is less plausible?” What cross tensions! If you want to know what the next generation of evangelicalism could and should look like, look to Alan Noble. 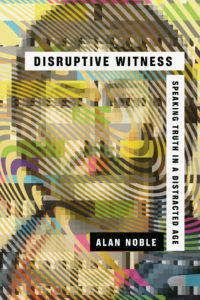 Why not order Disruptive Witness: Speaking Truth in a Distracted Age today? Start with the disruptive, subversive practice of ordering not from the secularized facelessness of Amazon. That would make no sense. Call or email us today! Oh my, I can’t wait to review this book in greater detail when it comes out at the very end of the summer. We are planning a book release party for this remarkable work here at the bookstore in mid-September (the author will be doing some things in Lancaster on Friday September 14th so we hope to have here in Dallastown on that Friday night.) One of the great joys of promoting this book, and hosting an event, is that there are expert linocut prints created for each chapter by our pal Ned Bustard of Square Halo Books and World’s End Images; the original artwork will be on display at the Square Hal Gallery in the Lancaster Trust building and we hope to have some prints to show at our event as well. Kudos to Brazos Press for including this handsome touch. Bustard, you might want to know, is doing a printmaking workshop at the legendary Glen Workshop sponsored by Image Journal. 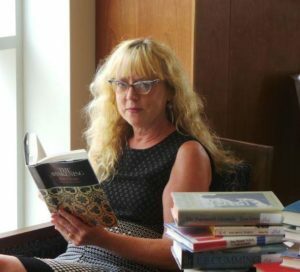 The prints done for each chapter of On Reading Well are remarkable in that they capture something of the essence of each story that literature Prof and book lover Karen Swallow Prior explores. Prior is an ideal person to do a book like this – each chapter is on a particular work of literature, each disclosing a classic Christian virtue – because not only is she a fine Christian university lit teacher, but she herself tends to narrate her own life through the lens of the books she has read. We raved here at BookNotes about her fabulous 2012 memoir, Booked: Literature in the Soul of Me (T.S. Poetry Press; $17.99),which tells some of her life story by way of a connected set of book reviews, showing how key books have played a significant role in her life. (Has anyone thought to do this before? Has anyone done it so well?) Swallow has learned much from books throughout her life and we have been inspired listening in, reading over her shoulder, as it were, in Booked and subsequent articles and lectures. 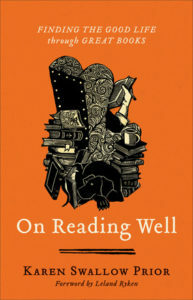 In the forthcoming On Reading Well she is a bit more didactic, explanatory, yet inviting, calling us to this journey of engaging good authors, reading well, for the sake of our own inner transformation and our life of faithfulness to Christ in the modern world. One of my favorite books is by C. Christopher Smith (of the excellent, provocative Englewood Review of Books) who wrote Reading for the Common Good which is very much about how reading widely can be missional, building bridges of insight and wisdom in our churches and neighborhoods. He counsels not only that we read for formation, but that we also read for mission – realizing that books are tools of discipleship and incarnational Kingdom living in the world. It’s the kind of stuff I say in my own workshops about reading and the role of books. “Read for the Kingdom!” I sometimes cry out. Smith gets it. Dr. Prior, who got her PhD from SUNY and is an award-winning English prof at Liberty University, has done a very significant biography of the literary figure, poet, and abolitionist colleague of William Wilberforce, Hannah More. There’s a poet and novelist for the common good, eh? She would certainly agree that reading well can be missional. Ms Prior has written for The Washington Post and First Things and the Atlantic. She is a member of something called the Faith Advisory Council of the Humane Society of the United State (like her beloved Wilberforce and Hannah More, she is an advocate for just treatment of animals.) Like John Fea and Alan Noble, above, she is our kind of scholar – thoughtful, deeply Christian, open to fresh ideas about the culture and our times, and able to hold her own in professional and secular venues. We admire her very much. But, oh my, she is in her very special wheelhouse – one I want to be in when I settle down and grow up – in this extraordinary work. On Reading Well is not just another reminder of the value of good books, an inspirational reminder to read solid stuff. Of course it is that – don’t we book-lovers just love books about books? – and for anyone who cares about great literature, buying this is nearly a no-brainer. Who wouldn’t want a Christian author reflecting deeply on The Great Gatsby and A Tale of Two Cities and Silence and Flannery O’Connor? My goodness, Hearts & Minds fans should be thrilled to hear of an evangelical engagement with Persuasion by Jane Austen and Leo Tolstoy’s The Death of Ivan Ilych and so much more. Did you get that? Yes, she studies and helps us learn much from Pilgrim’s Progress but also Tolstoy? She studies Mark Twain and Cormac McCarthy? How many embrace the virtues of reading George Saunders and Edith Wharton? Are you feeling me here, people? And here is the best part: this is, perhaps a bit unlike the general call to read deeply and widely by Smith in Reading for the Common God, or the amazingly fun and valuable Reading for Preaching by Cornelius Plantinga, or the many other overviews of great literature and what we can get out of them (for a view that isn’t necessarily Christian but wise and wonderful see The End of Your Life Book Club and Books for Living both by Will Schwalbe) Karen Swallow Prior’s On Reading Well: Finding the Good Life Through Great Books is a study of virtue. It draws a particular classical virtue from these works of literature and helps us learn how to embrace these virtues and be formed by them. The discussion questions that follow make it a great book for any book club but also makes On Reading Well useful for any spiritually-minded group that wants to grapple with call to character and being formed in the ways and virtues of Christ. If you’ve been reading Jamie Smith (just for instance) this talk about inner formation and virtue habits will ring true. I will confess that as a literary scholar I have always been somewhat resistant to moral criticism of literature because I fear it will become moralistic. But right from the start, Karen Swallow Prior puts these fears to rest. The moral dimension of literature is only one dimension of literature, she assures us, and it does not exist separate from the aesthetic form of a work. The moral viewpoint of a work is not stated abstractly but embodied in the particulars of the text, especially the characters. Which is to say, a book like this about the ways books can help us become more virtuous and Christ-like must not be simplistic or pushy or turn into propaganda. The stories selected have to stand up as stories, which means they must be allusive and entertaining and captivating and any reflections on them must themselves be somewhat entertaining. Like a really good Bible commentary, ruminations on the text must not squash the text but must draw us into it. If On Reading Well isn’t a good read, it has failed. Order it today and we’ll send it as soon as it comes, a bit before the official release date, I’m sure. You can see for yourself that these studies of Huckleberry Fin and The Road and “The Tenth of December” by George Saunders are as interesting and useful as I say. Will you grow in your passion for justice by her explorations of A Tale of Two Cities? Will you understand and deepen your own practice of the cardinal virtue of temperance by studying Gatsby? Will you become more faithfully chaste by reading Ethan Frome? How will her three book reviews of Silence, The Road, and The Death of Ivan Ilych help you manifest faith, hope, and love? The introduction to this fantastic book is simply called “Read Well, Live Well.” I hope you want this for yourself and your family and your group. Why not plan to pre-order a bunch to read together? The black and white art and the detailed study questions will help. You won’t regret it. Well, perhaps you think that these hefty books are a bit much — serious-minded and culturally significant; important. Indeed they are. But how about another pre-order that is fun and engaging, captivating and – yes, if Karen Swallow Prior is right about how good stories can transform us – also important in its own artful way? How about a fun, upbeat, fantasy novel that is well written without being overly intense, that will grab you with a well-told story and give you many hours of pleasurable entertainment? How about an enchanting, supernatural thriller, perfect for summer or early fall? I have not seen this forthcoming story yet but I can say a few things that might help convince Hearts & Minds friends and fans to pre-order this from us. Shawn Smucker is a very good writer. He’s somewhat local, hailing of an Amish background from Lancaster County. He’s done some self-publishing, some e-books, some speaking and travel, but broke out into the big-time with the first volume in this supernatural fantasy series. That wonderful little book was called The Day the Angles Fell which came out in hardcover in September of 2017. It was released in a paperback version last summer. Happily, The Day the Angels Fell won a Christianity Today Best Book of 2017 award in the fiction genre. It has gotten quite a buzz, with some local (trusted) friends telling us that this guy is the real deal. To be honest we were a little late to the game, but we’re glad to have been made aware of how good he is. We’ve not met, so I’m not just puffing a friend here; I am sincere that this is a novel published by a Christian publishing house that deserves to be widely known. It is an adult novel but could be easily read by sophisticated teens. 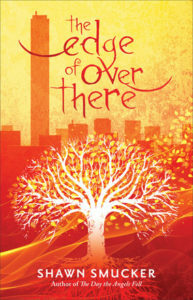 Tons of folks raved about the first one and many have been awaiting this sequel, The Edge of Over There where Abra Miller is summoned (in her search for a Tree of Life) to a portal in New Orleans, and has to contend with others that also want to follow into this gateway to Over There. We’ll have it here at the shop in early July so if you are one of those who have been eagerly anticipating it, on the edge of your seats, even, we can send on out as soon as we get ‘em in stock. 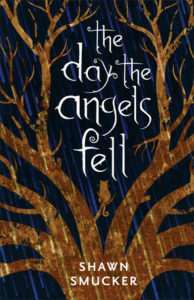 If Shawn Smucker and The Day the Angels Fell are new to you, why not pick it up in anticipation of the mid-summer release of The Edge of Over There? It would be a sweet thing to send out both, in fact. We can still get the first one in hardback (so it matches the hardback of Edge of…) or in a somewhat cheaper paperback edition. Just let us know which you prefer. We’ll do the 20% off either way. Listen to these reviews of Smucker’s writing chops. It’s not every day you hear this sort of buzz, and we’re very happy to endorse his work and invite you to pick these up. Who knows, maybe we’ll have him in the shop one of these days – stay tuned! Okay, friends, here’s another that is surely one of the most anticipated books of the year. Love her or not, Rachel is a rock star in some progressive evangelical circles and her coming out with great passion for marriage equality and opposing fundamentalists of all sorts has made her nearly a cause célèbre and a Person of Interest in the culture wars. I’m probably more conventional than her in my theology, but what is frustrating in her high profile social media status is that some have forgotten that she is not only giving voice to a large group of people within the church but that she is also a very good writer. Like her pal Nadia Bolz-Weber, say, she can really turn a phrase and tell one a heckuva fun story. She’s a very good writer and for anyone that is captivated by punchy and entertaining contemporary memoir and blazing writing, she is one to follow. I have no idea where she will come down on this weighty, freighted topic or what degree of scholarship or snark she will bring to her study of the Holy Scriptures. I do not think it will be any more dangerous than standard mainline perspectives – the subtitle, after all, is about “loving the Bible” as I am sure she does. 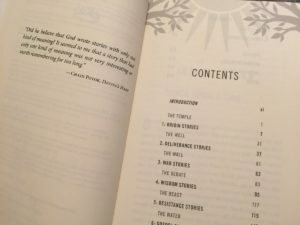 As a former fundamentalist who – as she beautifully tells in Searching for Sunday: Loving, Leaving, and Finding the Church – ends up a more moderate, liturgically-informed mainline Protestant, she surely doesn’t buy the literalism of her past. (She had broached this already in her first book about growing up in Dayton, Tennessee, what is called “Monkey Town” because of it’s famous faith vs. science Scopes Trial in 1925.) Okay, surprise, surprise, she’s not a fundamentalist and she doesn’t hold to old-school views of inerrancy. Good, since such views aren’t themselves Biblical anyway, owing more to rationalist worldviews of the Enlightenment. 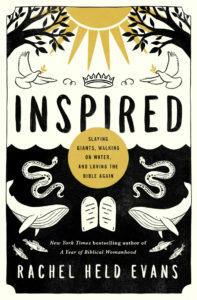 I wish the publisher had made an advance copy of Inspired: Slaying Giants, Walking on Water, and Loving the Bible Again available, as I can’t imagine what all she covers, how she tells it, or how much actual argument is in the book for a new kind of hermeneutic. I saw a Chaim Potok quote in this twitter shot, which made me happy. I suspect it is mostly storytelling and memoir and will fit well with her other books.She’s a very smart cookie, has studied theology, and done the work of research and scholarship, but also is an entertaining storyteller. She is, I think, an important voice among others who are helping us all navigate faith in a wise and fruitful way here in “secular age” and in the land of Trump. Dr. John Fea, above, shows what happens when we get off track, too easily conflating faith and some political ideology. Rachel’s story has been a sad one, a person hurt by the same sort of right-wing strictness that has hurt our body politic. If Fea gives us the big, historical picture documenting evangelical fear and havoc, Rachel Held Evans has told her particular story, often to very poignant effect. I’m looking forward to this, as are thousands of others. If you would like us to send it to you as soon as it arrives, in early to mid-June, we are very eager to help. It would make a great book club choice, a fine discussion starter and a fun read for a small group that can be discerning, together. I think it will be the sort of book that ought to be discussed among friends. Why not order a few?